Most towns in the Western part of Upper Austria and the county of the Innviertel are quite pretty, with the usual main square, town hall, church and merchant′s houses with pastel-coloured facades. Think of Schärding or Braunau. Ried im Innkreis is just another one of these predominantly Baroque, provincial towns. However, I was born there and due to my grandparents, I still have strong connections to the place. Since this website aims to provide local, personal information, you have the pleasure to follow me on a virtual guided tour to my birthplace. Let′s start with a bit of history. Ried was first mentioned in 1136 (on the 13th of November, to be precise) in a document referring to the place as the seat of a Bavarian noble family. One anecdote from Ried′s medieval history is the legend of the miller′s son Dietmar. He attended a crusade in 1191 and during the battle for Ikonia, the troops of the Holy Roman Empire lost their banner. Dietmar took off his shoe and pierced it on his lance and used it as the new banner, making an early example of a motivation speaker. The crusaders were impressed and quickly won the battle. Emperor Friedrich "Barbarossa" gave the market town of Ried to Dietmar as a reward for his smart idea - and possibly a new shoe. 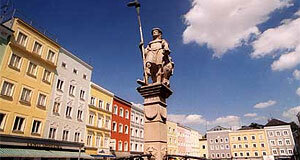 Dietmar and the shoe are displayed in a statue on the main square and a shoe is also in the coat of arms of Ried. Just like the entire Innviertel, Ried went from Bavarian hands to Austria and the other way round a couple of times over the course of the Middle Ages and early Modern days. Only in 1779, the Innviertel finally went under Austrian rule and stayed there apart from a short Bavarian occupation during the Napoleonic Wars (Napoleon himself stayed in Ried twice and was once almost assassinated there) and the Nazi period. Speaking of that: Ernst Kaltenbrunner, one of the most notorious SS killers, was born in Ried. Sentenced to death at the Nuremberg Trials, he was hung. More positive celebrities include the permanently drunk 19th century dialect poet Franz Stelzhammer (who died in the village Henndorf, where I grew up), who lived in a house on a square now named after him. He wrote the lyrics for Upper Austria′s anthem. And the Schwanthaler family of artists and craftsmen had a workshop in Ried from 1632 to 1838. This dynasty of masons and wood carvers is responsible for a long list of altars and other pieces of sacral artwork that you can find in many Baroque churches all over Upper Austria. For example in St Wolfgang or Gmunden in the Salzkammergut. Ried is best explored in a short walk around the town centre. The main square is the site of many old merchant′s houses. Since very few international tourists make it to the town, you will certainly be welcome to walk into some of them, for example the pharmacy. The Rathaus or town hall is worth noting. It was in Ried that the Bavarians signed a contract to change sides and declare war on Napoleonic France. You will find references to this time on one house on the corner between Hauptplatz and Stelzhammerplatz. On the latter one, have some ice cream at the Italian place to the opposite of the Stelzhammer Memorial. The third place worth noting is the Rossmarkt or Horse Market Square. From here you might smell the brewery: it is the oldest private brewery of Austria that is still in operation and was founded in 1446. If you walk up the staircase to the Capuchin Monastery, keep in mind that my great-great-grandfather was among the workers building it. It′s still in place and good shape. Other sights of interest: The Stadtpfarrkirche parish church and the Innviertler Heimathaus museum. In the latter one you will find a detailed record of life, culture and history of the "River Inn Quarter" (this is what "Innviertel", the name of the county, means). I was there only once as a child, but remember a very impressive collection of tools used by local rascals to hit or stab people. Young men from the Innviertel were notorious fighters in pubs, my great-great-grandfather (not sure if it was the same as the one who had worked on the staircase, but probably so) was an undertaker and night guard in Ried and stabbed to death himself. Otherwise, Ried is a county town so there is some life on the streets. At least on sunny days. It is probably a good spot to mingle with locals and chat to "real people". Upper Austrians might be provincial, but at least they are hospital. Especially if you stay for a pint or two.